Get your whole crew in on the sand-sculpting action, then quick, Instagram it before it gets washed away. Hopefully, you remembered to get the kind with a drink-holder. The views, the scent, the sound of the waves - it's all very hard to say no to. Keep a stack of pancakes and platter of bacon ready to go on the counter, buffet-style. You're located on a private stretch of Kauai beach. You'll love the peaceful seclusion of the resort. On Kauai’s eastern shore near Kapaa and Lihue, Castle Kauai Kailani sits on the site that was once home to Hawaiian royalty – a prime spot in the Garden Isle’s historic Coconut Coast area. Let’s just say sunrise viewers and beach adorers will be very happy here. There’s an oceanfront pool for swimming, Marco Polo-ing, or simply lounging. Then once the sun starts fading, head back to your condo to round up steaks or kabobs for the grill. If you’re taking the night off from dinner duty (lucky you), and want to stay close by, head across the Kuhio Highway to the shops and restaurants at Waipouli Town Center. Be sure to save a night for the Polynesian Feast at Smith’s Tropical Paradise Luau (self-proclaimed best on the island). Arrive early and stroll the 30-acre botanical gardens, keeping your camera handy for peacock sightings. Then feast on roasted pork and ono mahimahi, and sit back and watch the mesmerizing Tahitian drummers and the do-not-try-this-at-home Samoan fire knife dance. Spacious one-bedroom condominiums come with a den and balconies with garden or ocean views. Up early? Head out to the furnished lanai with a mug of freshly-brewed local coffee and a book, and enjoy the pre-kid-chaos quiet. The full kitchen is well appointed and ready for action with granite countertops and stainless steel appliances. Make good use of the breakfast bar, and rotate through your repertoire of family favorites, from omelets and thick-sliced bacon, to french toast with strawberries. Be sure your cleanup crew wipes the table well – you don’t want any leftover syrup slowing down your card games later. If you’re up for venturing beyond the beach and pool, you have easy access to charming, historic Hanalei and the stunning, rugged Napali Coast, both to the north. Head the opposite direction, and you’ll find Lihue, Poipu and Waimea Canyon. Rent bikes and ride along the oceanfront Ke Ala Hele Makalae (Hawaiian for the aptly named “path that goes by the coast”), or take a river cruise to the famous Fern Grotto – it’s only accessible by boat. 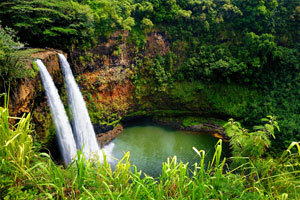 Play golf at Kauai Lagoons, or spend a fascinating afternoon learning about the sugarcane era at Kilohana Plantation. Kayak the Wailua River, go mountain river tubing, zip-lining or try an ATV adventure. Conquer the Nounou Mountain to prove the “sleeping giant” doesn’t scare you, and don’t miss the breathtaking 173-foot Wailua Falls. After action-packed days like this, dinner out may be your best option. Try the Bull Shed for steaks and fresh catch of the day – it’s just across the bridge at the resort’s sister property, Mokihana. Hukilau Lanai, Bubba Burgers and Pono Market are also great options nearby. - The front desk is located at Mokihana, 4-796 Kuhio Hwy, Kapaa HI 96746. The front desk is open 7:30 AM - 9:00 PM daily. Guests that are planning to arrive after hours must call security using the number listed outside the front desk, who will assist with the check-in. For more details please contact the property using the information on the booking confirmation to receive codes to lockboxes located outside the front desk. Miles of uninterrupted beaches meet at the mouth of Wailua River, which takes you deep into the rainforest, past waterfalls and fern grottos.